Piecing together two new nuggets of information about Samsung's upcoming midrange and flagship stalwarts, we can shape its Infinity-O display design better now. First off, there is a new screen protector leak, allegedly of Samsung's "Beyond" model which is the codename for the Galaxy S10. It reiterates an incredibly slim top and bottom bezels, and non-existent side ones that hint at a curved OLED screen. Such a shaved-off topper can only be achieved by moving the front camera somewhere else, and that different placement is shaping up to be a hole in the top left of the display itself or the so-called Infinity-O concept that Samsung showed not long ago. 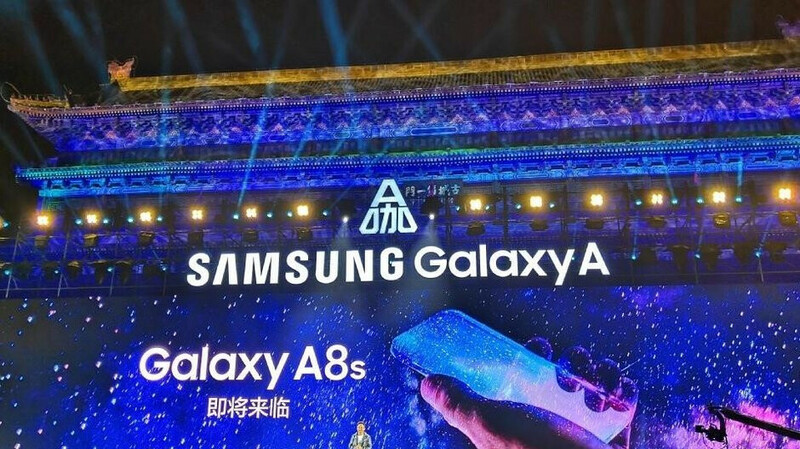 Samsung's first phone with such a design, however, is shaping up to be not the S10, but rather the midrange Galaxy A8s and an FCC filing for the handset, unearthed by Galaxyclub, just indirectly confirmed this. As you can see in the provided screenshot from the phone that describes the FCC labeling, there is a suspiciously offset icon set on the left side of the status bar. The notification and other icons have so far appeared on the far corner whereas here they have been moved towards the middle of the bar, freeing up space on the left... for the eventual selfie camera hole in the pierced display itself. We can't wait to see what other interface shenanigans Samsung may have employed to achieve its Infinity-O display design and how would such a concept behave while watching videos, for example. The A8s is expected to be announced by years-end so not much to wait before it all becomes clearer. S10 without 3.5mm Jack R.I.P Samsung. I was like this, even bought the lg v30 with its 3.5mm quaddac jack...... Then I realised I actually never used the headphone jack anymore. Sony headphones with the LDAC toggled on are really awesome. Thanks google for adding it to android. :) And even though i never liked beats, the beatsx are well balanced on the go inears, also great for working out. You'll never again miss the headphone jack. Top bezel looks better than a chin. You're joking eight. Look how ugly iphone are. Yet other manufactures try to make their phones look similar to iPhones lol Take a seat kid. LMAO as if apple NEVER does something someone else has. Your just upset Samsung doesn't have a notch and your precious iphone does. But the notch will be gone because they will copy Samsung yet again in a year or two. SO WHAT if they all copy BFD dont you get it, it just makes things better for us. That chin would still be thinner than the bezels on your precious iPhones. But its not symmetry so it’s ugly. It will fail again. Symmetry and iPhones doesn't go in the same sentence fool. If you call the ugly xs and max with a cutout at the top symmetry then you need to remove the cataract from you eyes. Good for them, I hope they sell some units this time around. Is that how iPhone sales are weak and only the Xr is selling well? Yeah I hope you get some sales too. iPhones weak sales is still much greater than lifetime sales of Samsung flagships.